A flight from NYC to Florida had to be diverted to South Carolina because some passengers aboard complained of burning throats and chest pains after a potential hazmat situation from an unknown substance that passengers say smelled like "dirty socks." 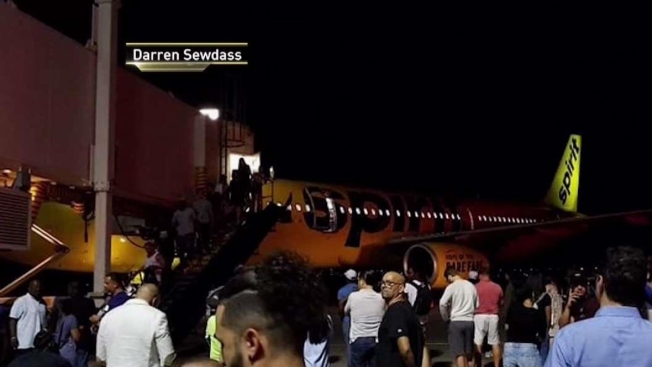 Two-hundred-twenty passengers were on board Spirit Airlines Flight 779 from LaGuardia to Fort Lauderdale when it was diverted to Myrtle Beach after the airline said an "odor developed in a section of the aircraft." Officials were linking the medical complaints to that unknown substance that some passengers say smelled like “dirty socks.” There were concerns of a possible chemical on the aircraft that was making people sick, but nothing out of the ordinary was found. Despite no substances being discovered, fire officials say seven to 10 passengers were transported to an area hospital. Their condition was not immediately known. Spirit Airlines said the source was being investigated and although the diversion was an inconvenience, the safety of their guests is "paramount." “A supplemental aircraft is en route to Myrtle Beach to pick up our guests,” Spirit Airlines said in a statement. Photos shared to social media show hundreds of passengers on the tarmac at Myrtle Beach as they wait for another plane to finish the journey to Florida. FlightAware reports the flight took off from South Carolina around 3:30 Friday morning and landed safely in Fort Lauderdale around 5 a.m, about five hours after its original scheduled landing.